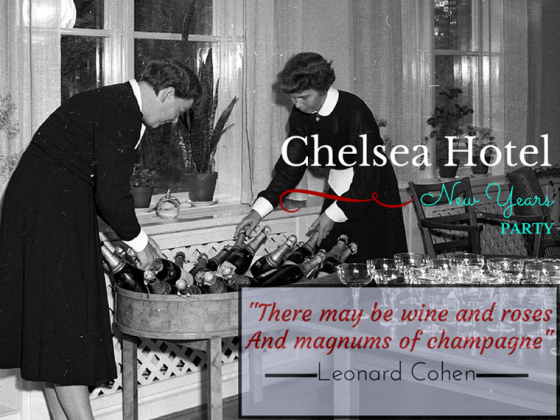 We invite you to join the party at the Chelsea Hotel (aka the Firehall Arts Centre) to ring in 2015 on New Years Eve! The Firehall is throwing a fabulous bohemian bash, complete with champagne, hors d’oeuvres, & of course lots of Leonard Cohen songs along wit ha sing-along to Cohen favorites at the après-show party! Your ticket includes entry to the Chelsea Hotel show, nibbles & a glass of bubbly at midnight. The perfect party for Cohen fans! Tickets are limited – $75 per person. This entry was posted in Events, Firehall News and tagged champagne, Chelsea Hotel, New Year's Eve Vancouver, New Years Eve Party, New Years Party. Bookmark the permalink.